In spite of all the talk about quantum computing becoming the mainstay in consumer devices, progress in that direction has been painstakingly slow and inordinately expensive. However, all that can change fairly soon if Google has its way. 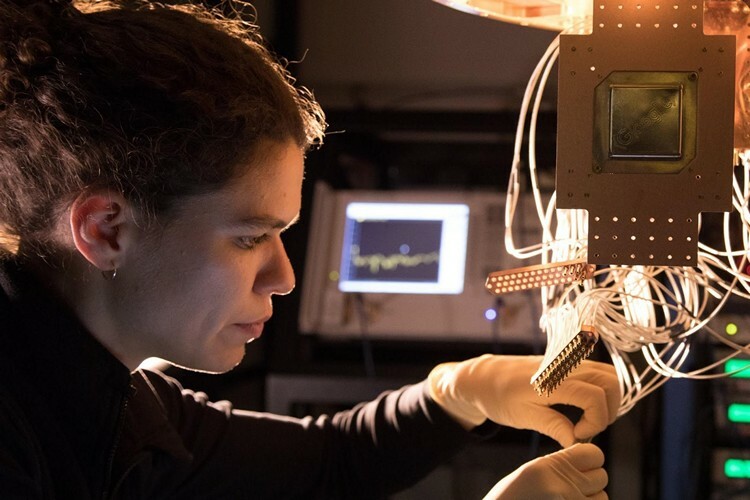 With a view towards providing “a testbed for research into system error rates and scalability of our qubit technology”, Google showcased a gate-based quantum processor called ‘Bristlecone’ at the annual American Physical Society meeting in Los Angeles this week. The company believes that the chip is capable of finally bringing the power of quantum computing to the mainstream by solving ‘real-world problems’. According to Google, every Bristlecone chip is scaled to a square array of 72 quantum bits (qubits), which is significantly more than the 49 qbits that the company says is required to ‘comfortably demonstrate’ quantum supremacy. The company, however, warns that it isn’t all about the specs, saying that Bristlecone could well be “a compelling proof-of-principle for building larger scale quantum computers” if it can achieve the best error rates of its previous 9-qubit linear array technology, which the company claims demonstrated low error rates for readout (1%), single-qubit gates (0.1%) and two-qubit gates (0.6%). According to the company, “Operating a device such as Bristlecone at low system error requires harmony between a full stack of technology ranging from software and control electronics to the processor itself. Getting this right requires careful systems engineering over several iterations”. Quantum computers outperforming traditional supercomputers in real-world scenarios may well be in the realms of science fiction right now, what with most use-cases for quantum computing still strictly restricted to the theoretical or experimental domains. However, with proper error correction and better energy efficiency, Bristlecone (or more likely, its future derivatives), could potentially be the first device ever to exhibit quantum supremacy, which will hopefully, open the floodgates for more cost-effective and energy efficient computing going forward.